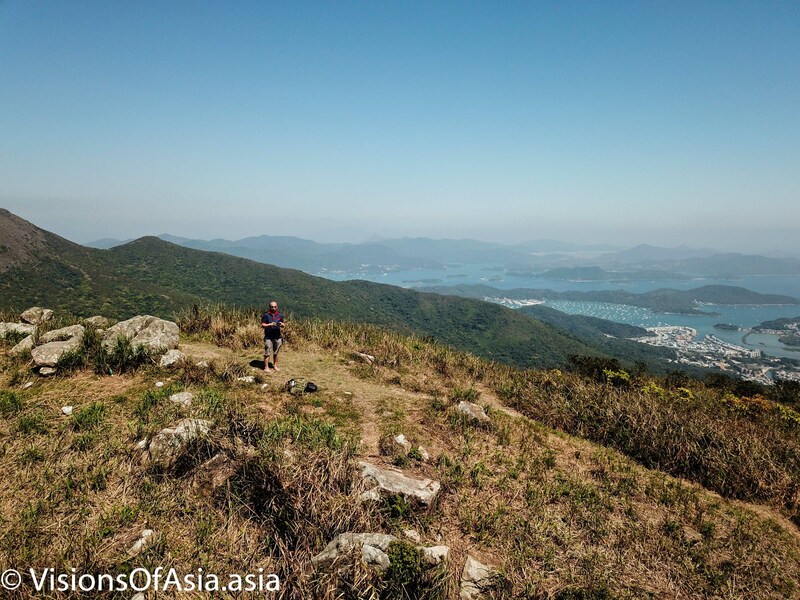 November 10, 2017 May 31, 2018 VoAadmin Barefoot hiking, Barefoot running, Encounters, Hiking, Hong Kong, PhotographyTagged ACL recovery, barefoot, barefoot hiking, biomechanics, hiking, Hong Kong, Iphone, jat's incline, Kowloon Peak, Observation platform, road, running, Sai Kung, silver ferns, wild boarsLeave a Comment on Kowloon Peak barefoot! 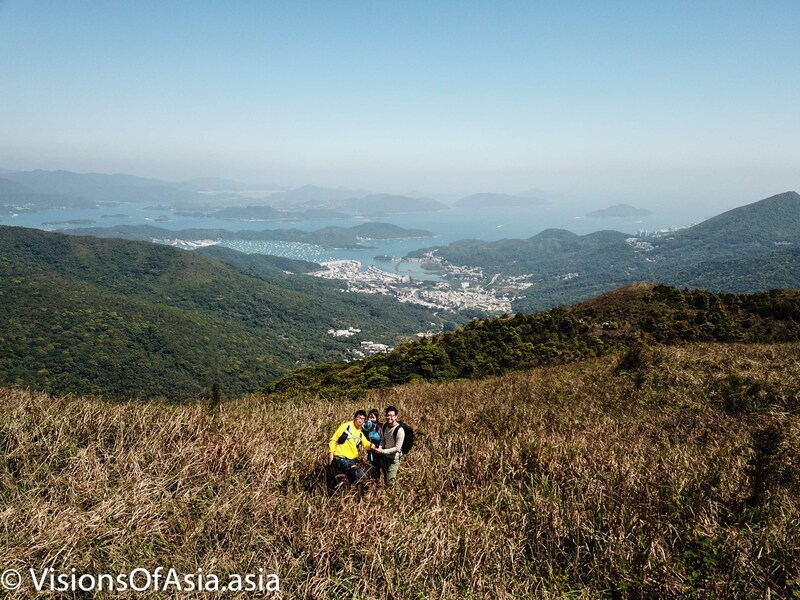 While I often climb Kowloon peak and suicide cliff in particular, so far I always did it with hiking boots or trail running shoes. 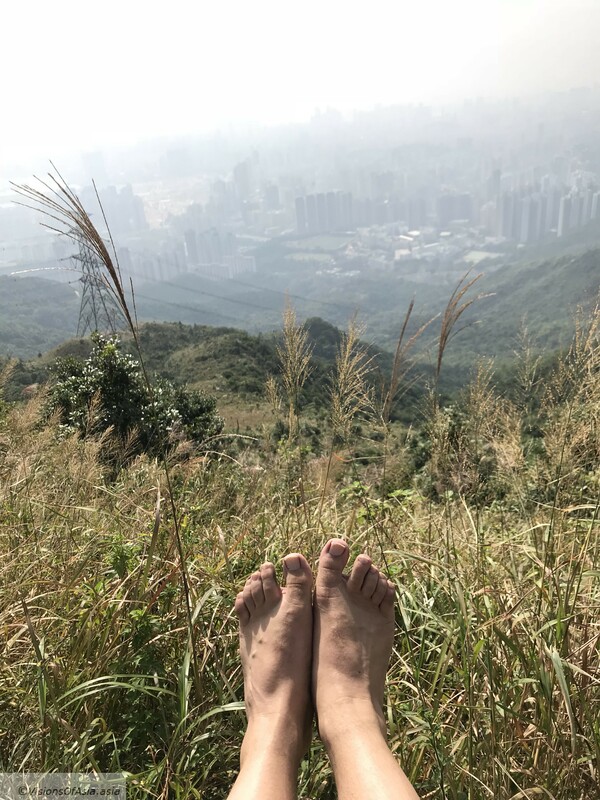 As a few weeks ago, I started running barefoot, I decided this time to run/hike to the top of Kowloon peak barefoot. 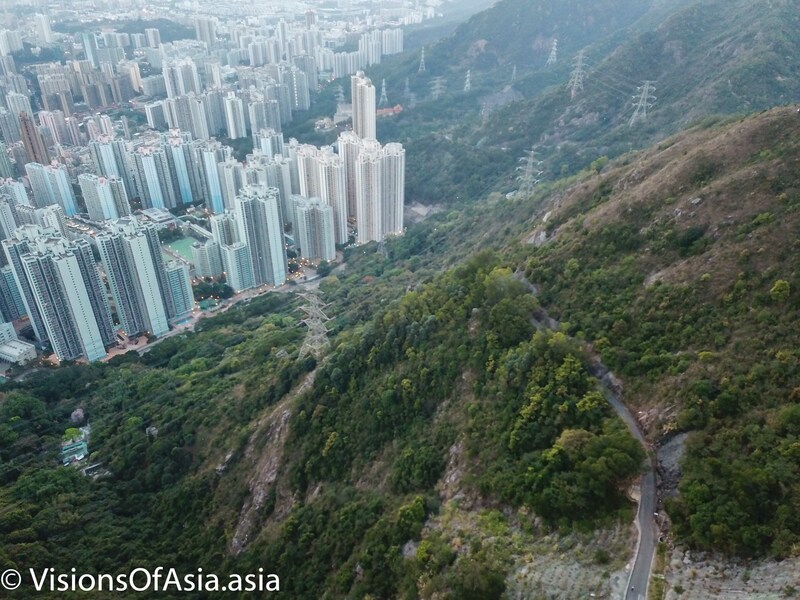 At the top, enjoying the magnificent view over Kowloon. Firstly a few words of explanation for what might seem an unconventional decision at first. I have had an ACL surgical reconstruction about one year ago (ruptured the ACL with karate). Rehabilitation has been overall good, except that I would continue having pain at the patella tendon when attempting to run with shoes. I had a period of barefoot running when I lived in Paris and was much younger (because shoes were hurting my toenails). 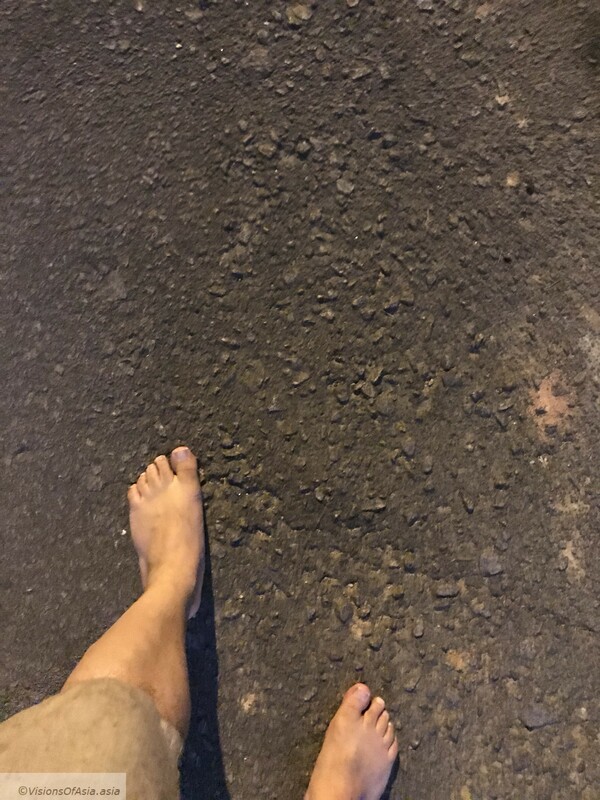 Here, as I was growing frustrated with being unable to revert to a more engaged fitness lifestyle, I decided to try running barefoot in the park in front of my apartment. Incredibly (but not astonishingly, given the biomechanics of barefoot running), I didn’t feel any pain in the knee. It is true that the running track in my park, is pretty absorbing and hence rather forgiving for the joints. It also helps that many parks in Hong Kong have reflexology paths. After I started running barefoot, other areas of the body have improved too, from calves to ankles which have also been reinforced. I have, on average, covered around 5 kms per session, with about 1/2 hr running and feel much better physically. The feeling of freedom is also impressive. I added burpees and jumping jacks to my training routines, and, of course, do a lot of squats. On the other hand, the calves and ankles were extremely sollicited. As I took it nice and easy though, I did not suffer too much with those muscles. 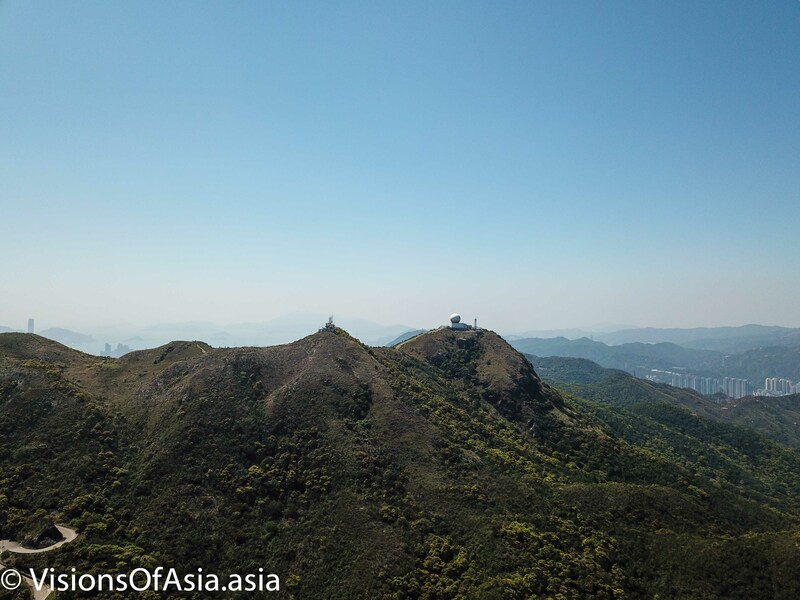 The logical development was to attempt running on longer distances and a logical target was my favorite mountain, Kowloon Peak. 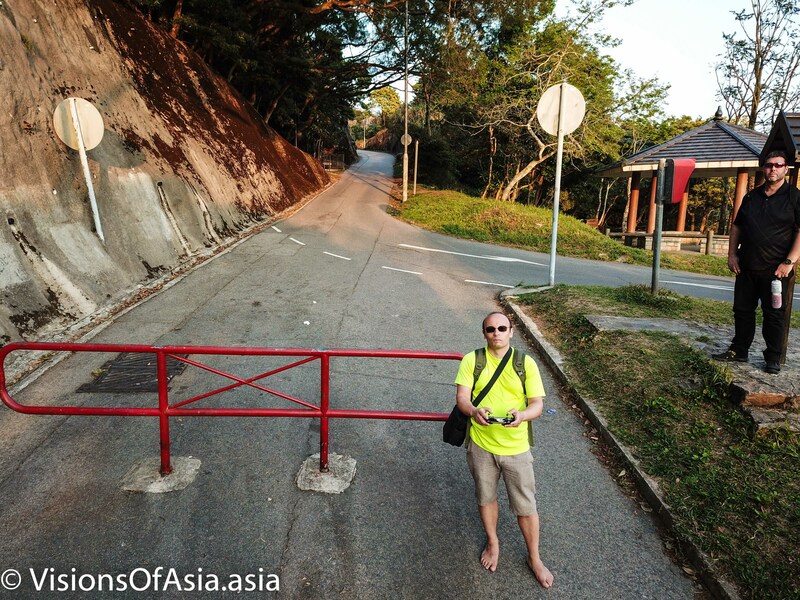 Kowloon Peak barefoot… but only on road! 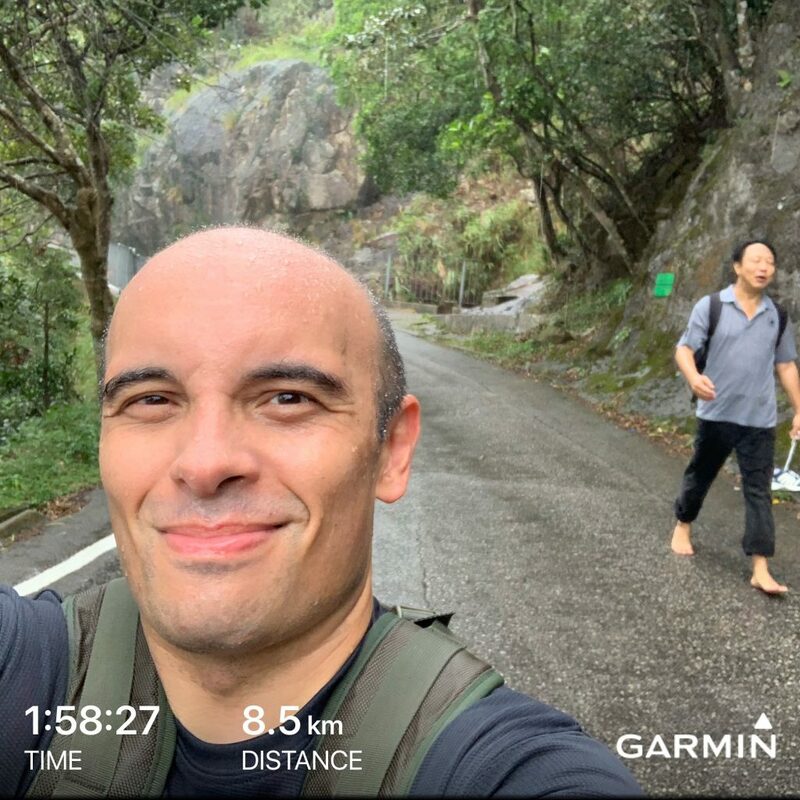 The day before this hike, I took a stroll to the 10,000 Buddhas monastery with trail running shoes, and I emerged out of it, quite exhausted in my legs and feet. I was looking to release the tension. 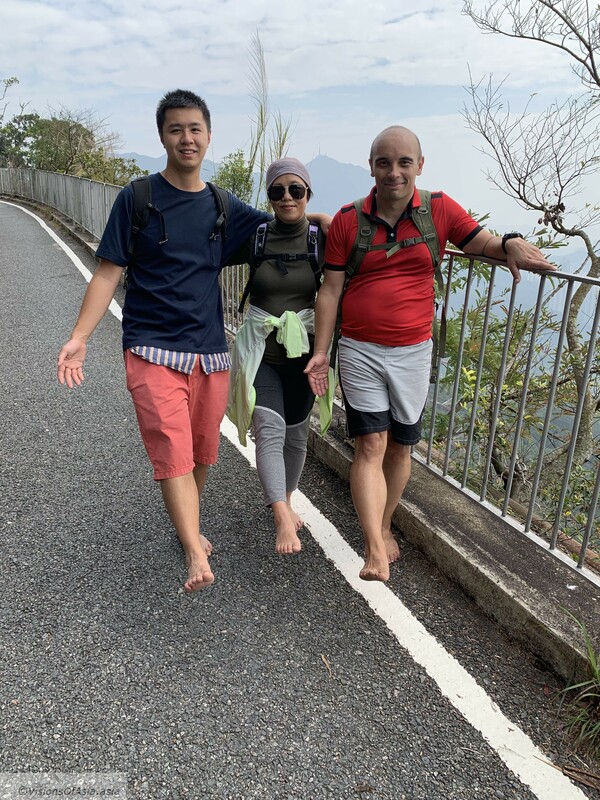 Obviously, for a first time, I was not going to attempt suicide cliff barefoot, so I opted to take the road which climbs up to the Kowloon Peak observation point. Overall, the road is quite flat, but there are a lot of gravel in places, so it can be uncomfortable in places when running. As my cardio is not yet up to par, I walked on the steepest sections, but it was still lovely. The level of sensory feedback from the feet is quite different. I am not a hippie and I am very far from the pseudo-naturalism of some barefoot running/hiking proponents or stories of “earthing”. Return to nature is not my cup of tea. Nevertheless, as far as I am concerned, it was a nice experience (try feeling the warm asphalt under your feet in autumn). 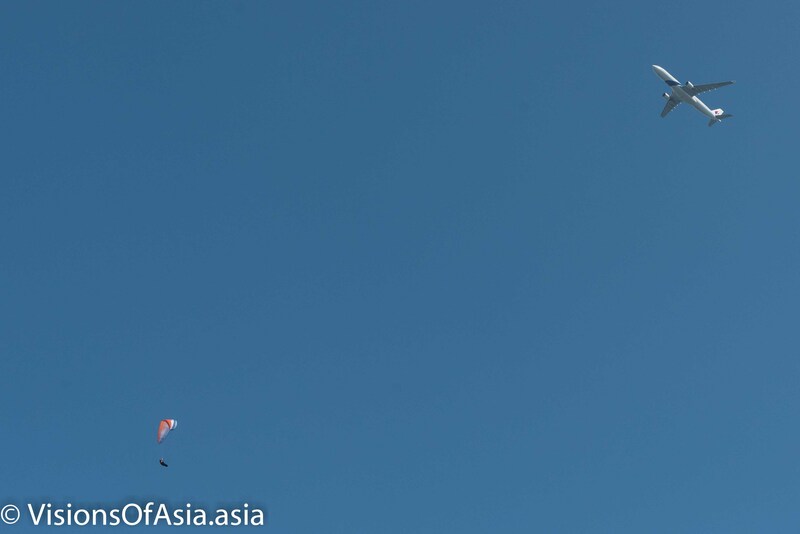 Sometimes, you have to feel free to do things differently. As for the impact on the body, strangely enough, the impact is much less than with shoes as long as you run with the forefront of your feet (and not landing on your heels). 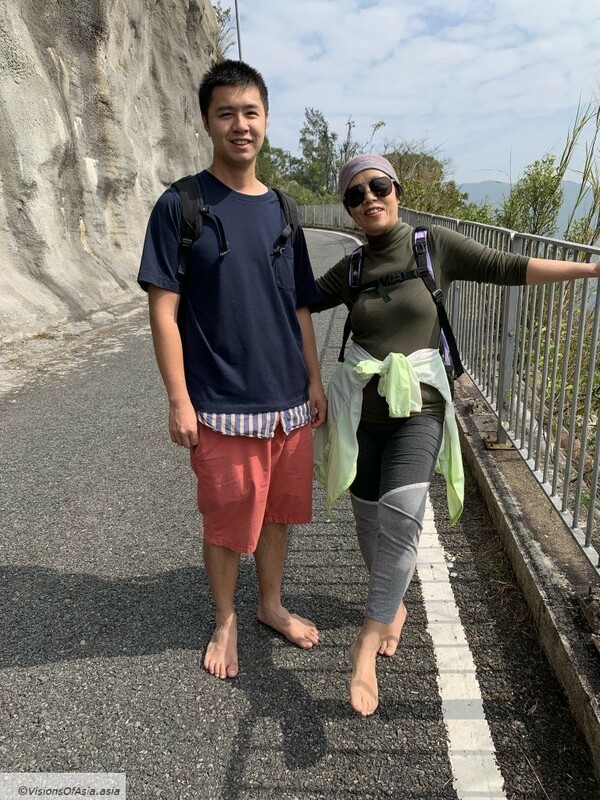 I must say I felt quite light on my feet (if you recall, had a pair of falls on my last hike, due to ankles buckling – but I was also carrying 15 kgs gear!). 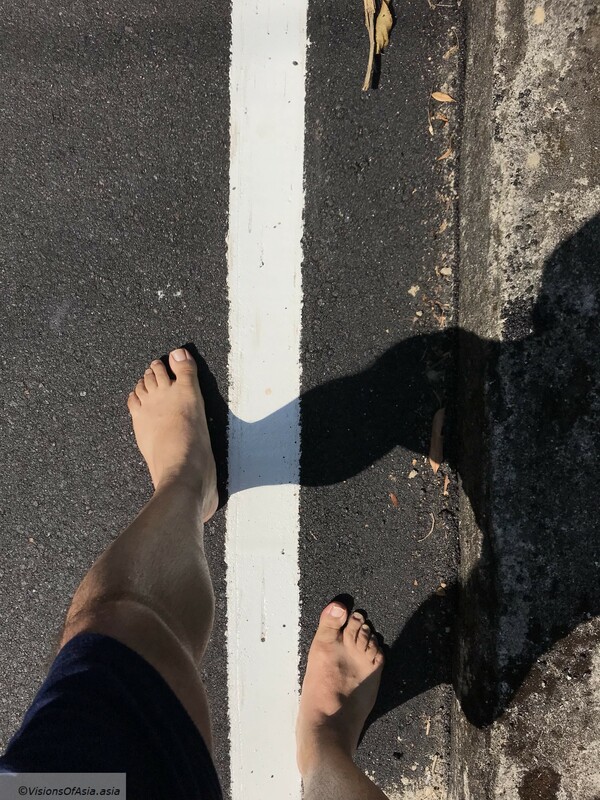 Walking the line barefoot and feeling the warm floor beneath. 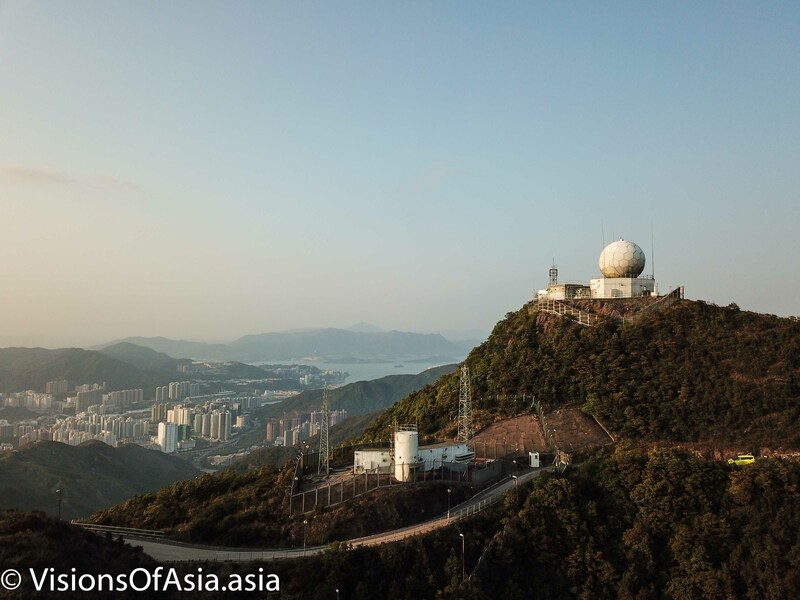 Kowloon Peak offers a number of interesting view points, especially on Sai Kung. On this period of the year, silver grass start showing, so that makes a quite lovely foreground for pictures. As I was focused on running, I did not take much photographic gear with me, using only my Iphone for these pics. 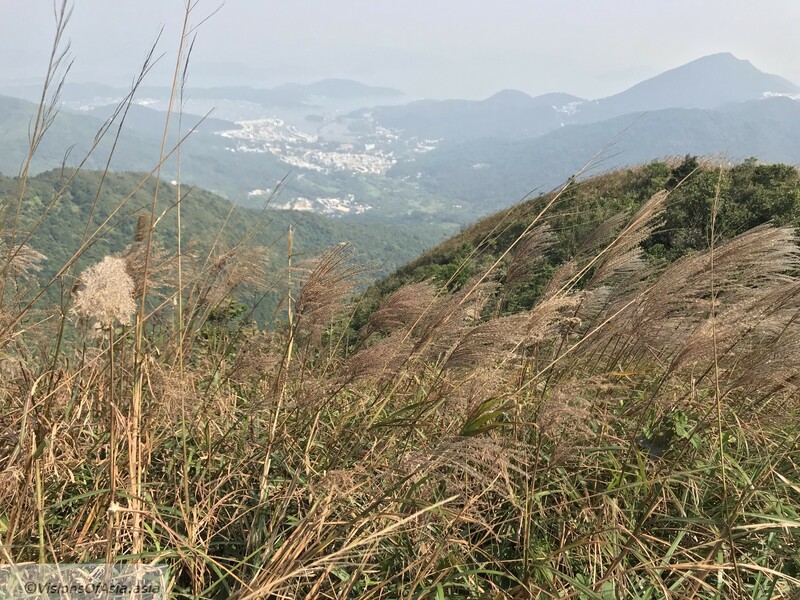 A lovely view of Sai Kung with silver fern in the foreground. 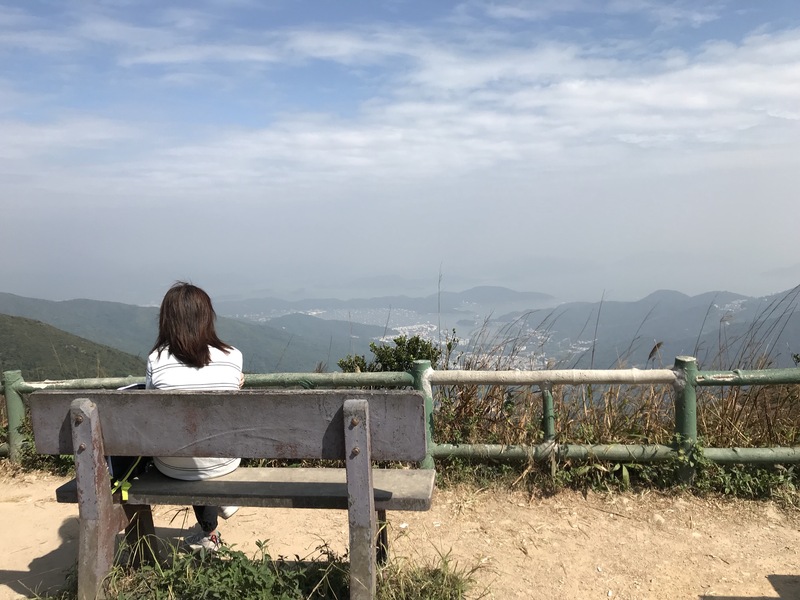 At the Kowloon peak observation platform, you can sometimes take some nice nostalgic pictures of onlookers while they embrace the view before them. 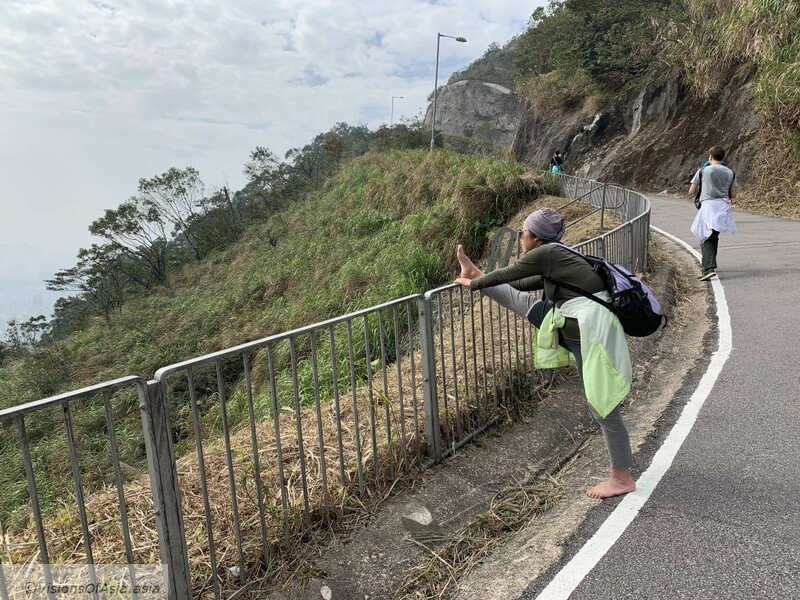 Of course, running/hiking barefoot is an activity a bit extreme/marginal, so you will inevitably elicit reactions from the people you cross (and God knows there are a LOT of hikers on Kowloon Peak on a Sunday!). Hongkongese are quite conservative re. footwear, but they are accustomed to walking barefoot at home. Some reactions are of surprise, others can inquire if you are ok (a lady asked me if I was ok, when she saw me walking barefoot). One older guy even gave me a thumbs up. A smile and confident demeanor will solve those little situations. After all, you do what you like. Obviously, barefoot running is not for you if you cannot feel free to be “different”. It also requires quite some confidence in yourself. 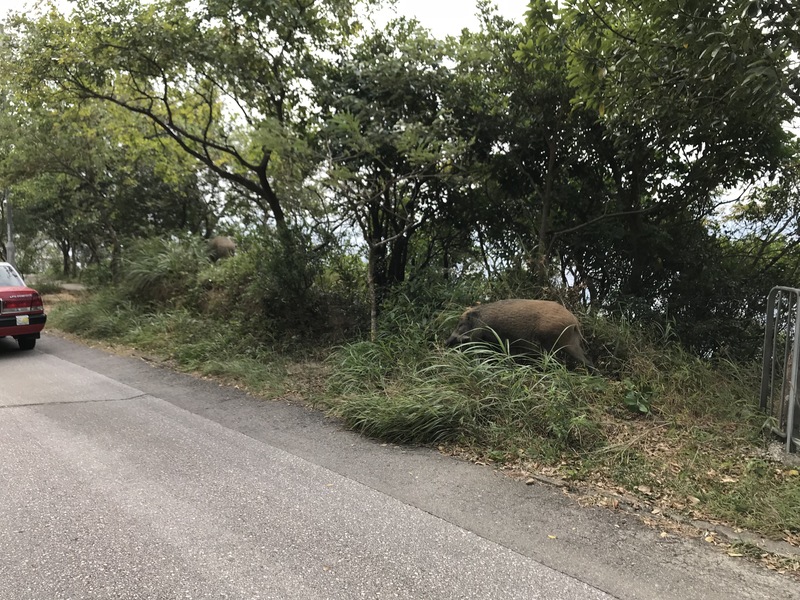 I guess this passage will come across as cliché when it comes to running “close to nature”… But I did encounter some wild boars on Jat’s Incline. I stopped by to take a picture and then resumed running. While many accounts talk of the danger of these animals charging you, I left them alone and they didn’t care about me running past. So, if you ever encounter wild boars, just give them a wild berth. In this case, it was three specimens with a juvenile. Trying to caress these animals, feeding them or getting too close might lead them to feel threatened and to charge, so please never try anything like that. As I mentioned earlier, this time, I hiked/ran on a flat road. While there were inconveniences such as gravel and stones, it was not climbing up on suicide cliff in any way. I have not yet done something like that, as my main focus when hiking is safety. However, from past hikes, I can confirm two points. Firstly, I did find that having hiking boots with a rigid sole was rather an inconvenience when hiking on a mountain. The lack of flexibility of the sole does not adapt well to climb on rough terrain. I do climb better with my trail running shoes which have a much more flexible sole, so I guess bare feet are even better. Secondly, I did see an older guy going down the suicide cliff route with flip-flops (which is more dangerous for tripping/slipping), so that seems feasible even if it sounds a bit crazy. Finally, I live in a tropical country, where the floor is often populated by insects or other animals, and you certainly don’t want to be caught by a snake barefoot, but most of the time, snakes will just slither away, as long as you don’t walk on their tail. So, the issue is still open to debate in my mind. 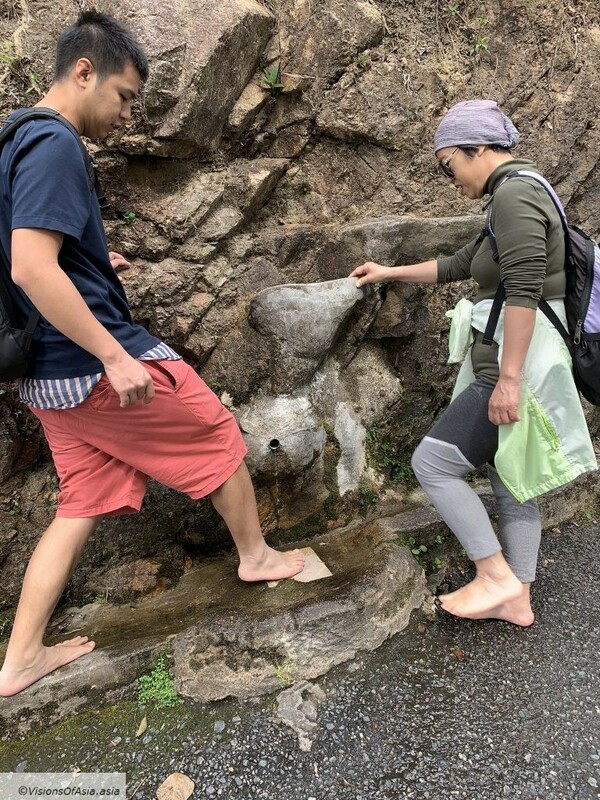 I will certainly try hiking the Dragon’s back barefoot (I saw people tackling the trail in flip-flops) before taking on more challenging trails. This brings me to my conclusion: never attempt to start hiking barefoot on trails that you don’t know! 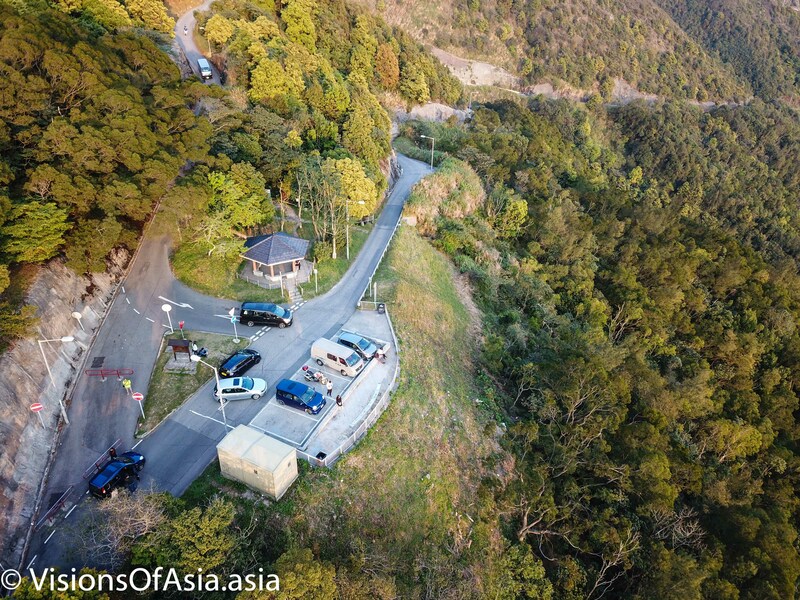 At the very least, you should have done a couple of reconnaissance hikes shod and should be aware of both, the terrain and the configuration of the hike. Finally, you MUST bring along some shoes/flip-flops and some first aid. This will help protect against mishaps or cross difficult passages.